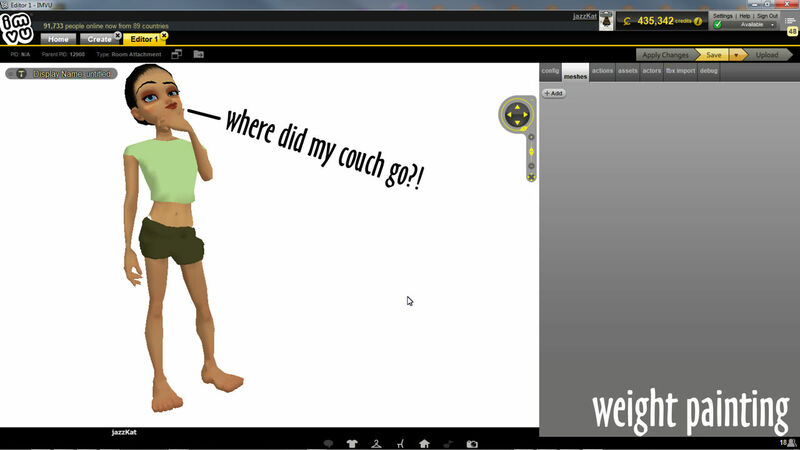 To export meshes to IMVU they need to be associated with the appropriate skeleton for the product being made, a couch for example has to be linked to a furniture item skeleton otherwise nothing appears in IMVU and/or the item won’t work, articulate or move the way it should. In Blender this is a two part process; 1) Parent mesh to skeleton or Armature, and 2) link nodes or bones with mesh vertices using Weight Painting. Weight Painting is two things; assigning an ‘influence’ value to something (weighting), and the act of doing this (painting). In Blender this is done in a dedicated Weight Paint mode; with a mesh selected choose Weight Paint from the interaction mode selector menu (or switch using Ctrl+Tab shortcut). When enabled the current active mesh turns blue, the Tool Shelf updates showing a new set of options, and the mouse cursor displays a pinkish tinted circular outline representing a brush. If the mesh has yet to be painted it will appear blue, if it has already been painted, or values already assigned though other means (vertex groups, see section below), it will be coloured, typically red, green. orange, yellow or pale-blue. When enabled the active mesh turns blue, a set of new options appear in the Tool Shelf, and the cursor displays an circular outline. 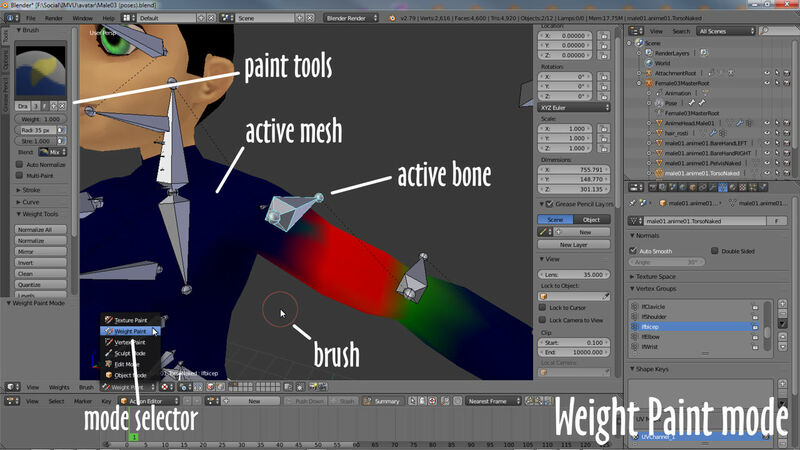 The next step once Weight Paint mode is active is to select a bone or node and then paint the mesh with the cursor/brush to link painted areas with the skeletal element highlighted. 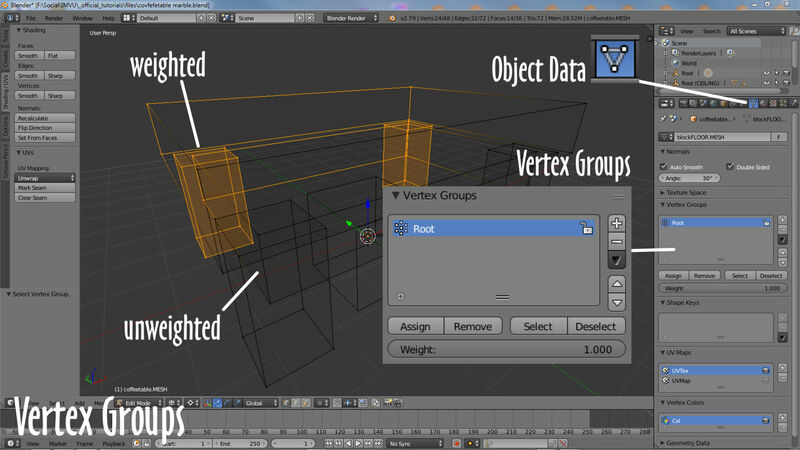 As this is done a corresponding Vertex Group is created, named or labeled to reflect the bone or node chosen prior to painting. Depending on the product this painting process then needs to be repeated for each bone or node that’s to influence the mesh, for example 86/7 bones for an avatar replacement, or just one for a simple furniture item. 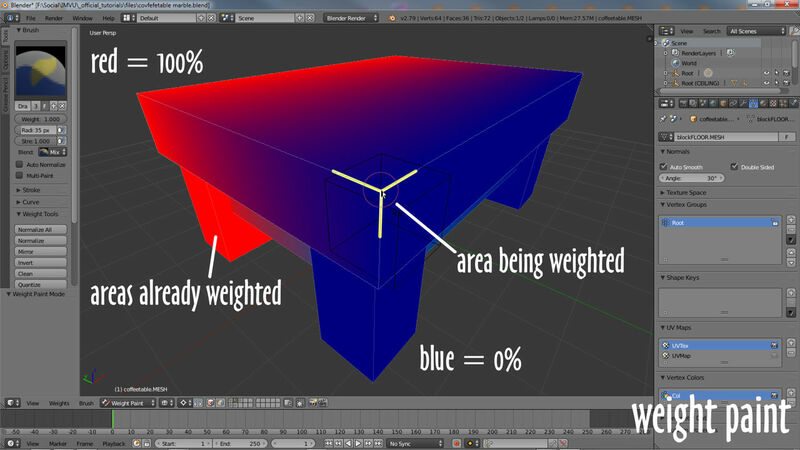 Similar to Smoothing, the actual element painted are vertices, these store weight information because they are the most basic structural component of a surface. The active mesh changes colour as its painted, blue represents 0 influence (the bone or node won’t do anything), red 100% influence (the bone/node has complete control). Weight Painting is a more intuitive way to create, assign and manage Vertex Groups, the colours are immediately readable as representing values of influence, the degree to which a bone or node can move, articulate or manipulate a given vertex or mesh section – red is 100% effective, blue is 0% or ineffective. Painting can be tricky for symmetry, when something has a left and right that need to articulate equally, so some manual editing of vertex group values may be necessary in Edit Mode rather than trying to balance values using colour – in Object Data Properties select an entry in the Vertex Groups list and use the buttons below to Assign or Remove selections, or (Shift+) right-click individual vertexes and Assign or Remove, changing the Weight value below where needled, altering the degree of influence the group has over the selection. When using node based skeletons vertex groups may need to be created first before painting assignments as their selection doesn’t highlight correspond mesh sections as occurs using Armatures and Bones.